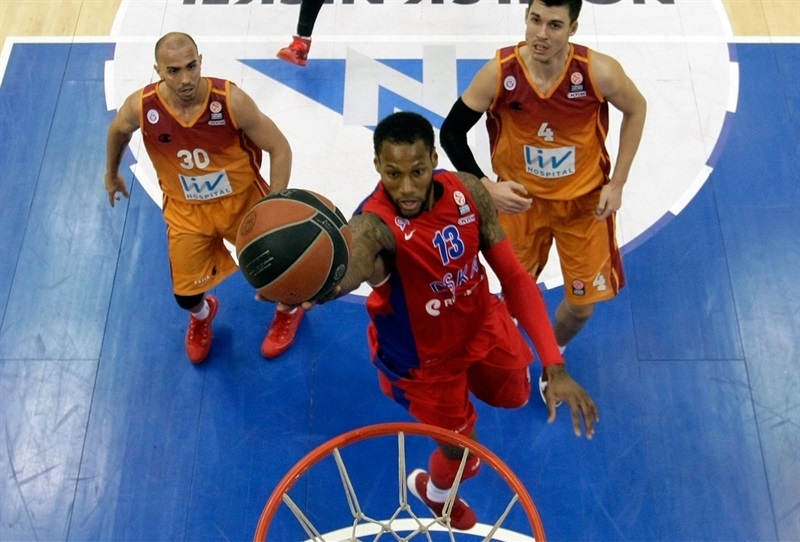 Sonny Weems scored all 12 of his points in the extra session as CSKA Moscow outlasted Galatasaray Liv Hospital 86-85 in a thriller Friday at Universal Sports Hall in the Russian capital. CSKA won its eighth straight home game and improved to 11-2 in Group F of the Top 16, which ensures Coach Ettore Messina’s side at least a share of first place heading into the last game of the stage. 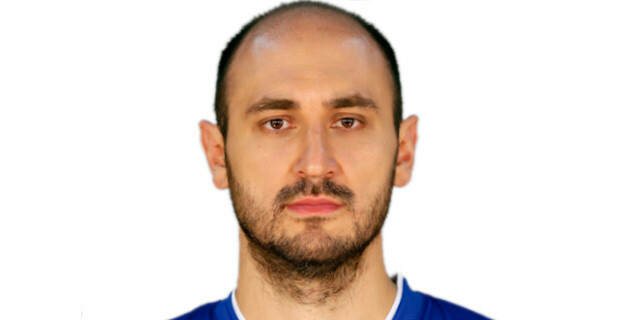 Despite a record-setting night for big man Zoran Erceg, Galatasaray dropped to 6-7, but enters a decisive home game against Partizan next week with a chance to reach the playoffs. Erceg set club records with 35 points and 7 three-pointers made. The point total was also the most in a Turkish Airlines Euroleague game this season. 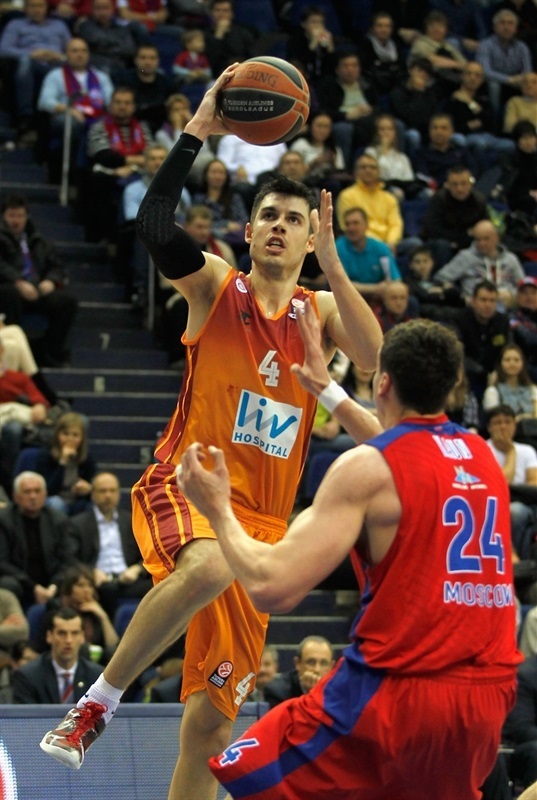 Sasha Kaun paced the winners with 14 points on 6-of-7 shooting. Milos Teodosic added 13 and Nenad Krstic and Weems finished with 12 apiece. Erceg grabbed 9 rebounds in addition to his 35 points. Malik Hairston scored 13 and Carlos Arroyo tallied 9 points and 8 assists, but left the game in overtime with an apparent injury. Both teams went inside early; Manuchar Markoishvili fed Furkan Aldemir for a slam before Victor Khryapa assisted Kyle Hines for a free throw. Aldemir missed at the rim twice – including a rejection from Krstic. 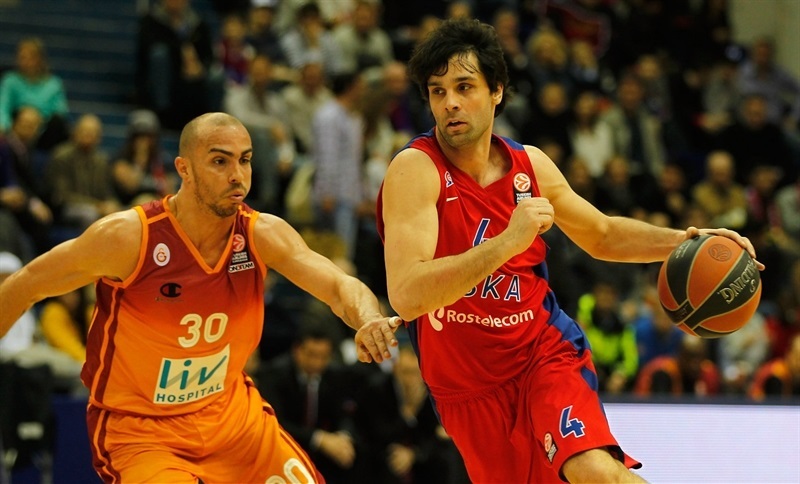 Teodosic put CSKA on top with a three-pointer and Khryapa added another for a 7-2 start. After a timeout, Erceg sank a triple and Aldemir scored on the offensive glass to close the gap. The momentum remained with the visitors as Markoishvili drained a three in transition to tie it and Hairston sank a jumper from the corner to make it 11-13. 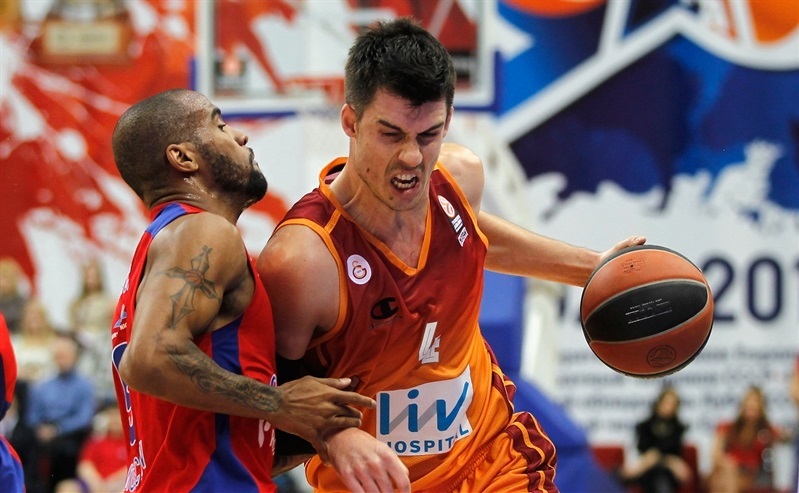 Khryapa responded for the hosts, but Arroyo nailed another Galatasaray three-pointer. When Markoishvili finally missed from downtown, Erceg elegantly tipped the rebound in for a 13-18 advantage. Milan Macvan rejected Teodosic at one end and took a dish from Arroyo for a layup at the other. 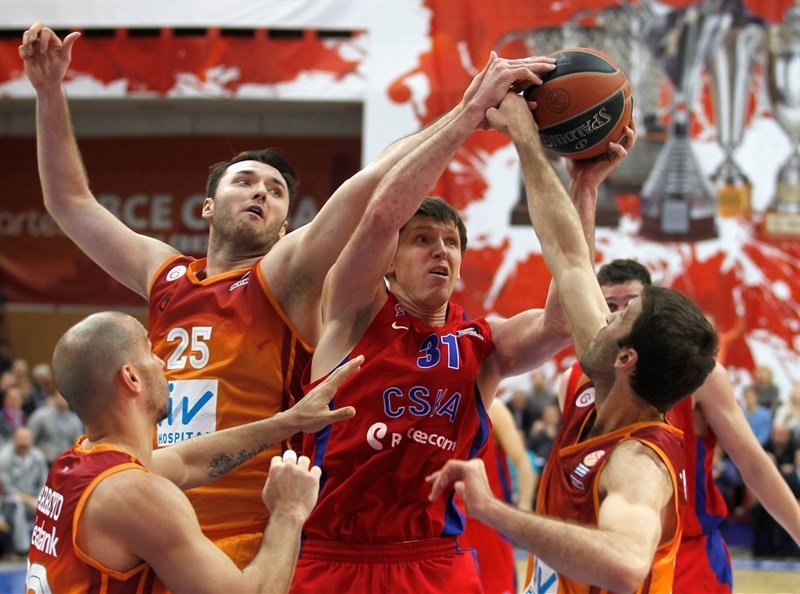 Vladimir Micov fed Kaun for a slam on the break and Andrey Vorontsevich drained a three to bring CSKA back within 2. However Erceg connected from downtown before free throws from Micov and Arroyo left the visitors up 20-24 through 10 minutes. Vitaly Fridzon and Micov each found Kaun for dunks, but a runner from Erceg and a slam from Hairston kept Galatasaray in front. Aaron Jackson and Micov each sank jumpers to even the score at 28-28. Arroyo drove, then stepped back for a jumper to put the visitors back in front. Jackson split free throws to leave 29-30 on the scoreboard at the midway points of the quarter. 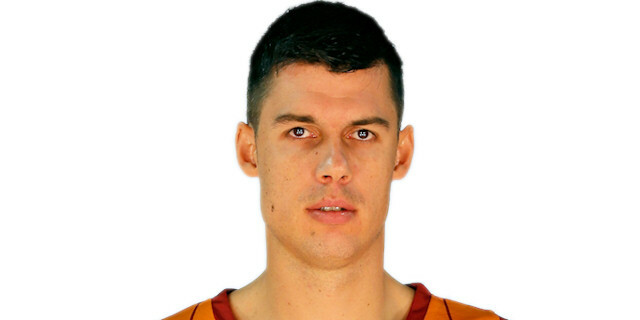 Ender Arslan scored 2 from the line and Sinan Guler netted a floater as the Galatasaray lead swelled to 4. CSKA came right back on a Teodosic triple and a Khryapa jumper to tie it at 34-34. Hairston and Arroyo each split free throws and Macvan blocked Teodosic, igniting a fast break that Erceg finished with a slam. Hines almost single-handedly tied it, muscling his way to a pair of baskets to make it 38-38 at the break. Both teams came up empty on the opening possessions of the second half before Galatasaray got going with an Arroyo-to-Hairston slam. Nearly three minutes passed before Krstic scored CSKA’s first points. Hines gave CSKA a 42-40 lead from the line. Hairston took an alley-oop pass thrown by Arroyo at halfcourt and stuffed it as the teams stayed close. Erceg’s third three of the night gave the visitors a 44-45 lead midway through the quarter. Arroyo continued to feed the Galatasaray big men and found Aldemir for a layup. Fridzon tied the game with a three on a three-chance offense. Aldemir dunked on the ensuing play only to see Kaun respond with a slam-plus-foul. Kaun missed the free throw, but Hairston, trying to knock the ball off the rim, tipped it in for a CSKA basket. Erceg nailed a three to put Galatasaray back ahead 51-52. Erceg and Kaun traded baskets in the paint. The lead changed hands as Krstic sank a jumper and Macvan responded with a triple. Kaun’s hook shot made it 59-59. After Macvan missed 2 free throws, Krstic scored underneath. 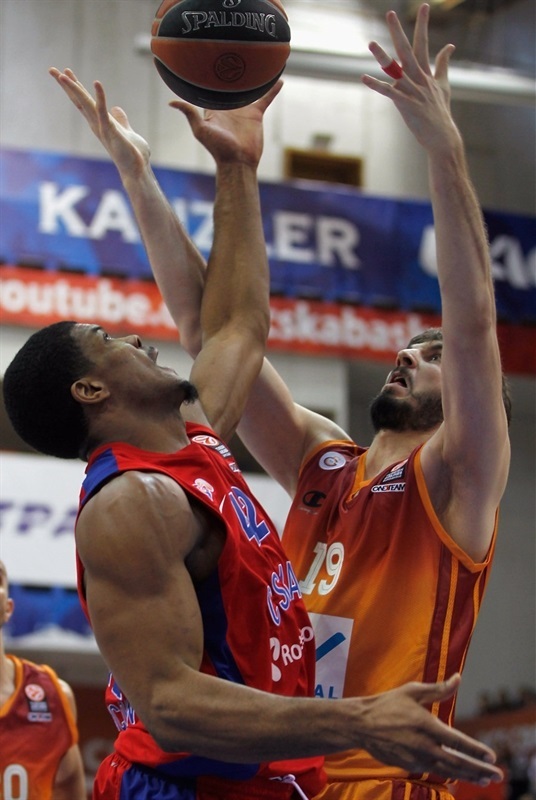 A Galatasaray shooting slump hit at the worst possible time; the visitors went nearly four minutes without a shot made, but CSKA failed to capitalize. An Erceg triple tied the game at 62-62 with more than three minutes remaining. Erceg committed his fourth foul while stopping Kaun at the line; the CSKA center made the ensuing free throws to put his team up. After a tie-up between Kaun and Arroyo, Markoishvili won the ball and nailed a three that gave the visitors a 64-65 lead with 1:24 remaining. However left alone in transition, Fridzon countered with a triple with 51 seconds left. Erceg free throws evened the score at 67-67 with 37 seconds to go. The end of regulation featured a pair of turnovers – a bass pass from Teodosic and another from Arroyo – before Teodosic’s prayer shot missed and led to an extra session. The intensity continued with another tie-up after the opening tip. Fridzon struck first for the hosts, but Erceg responded with his sixth three of the night. Free throws by Teodosic and Hairston tied the game at 71-71. 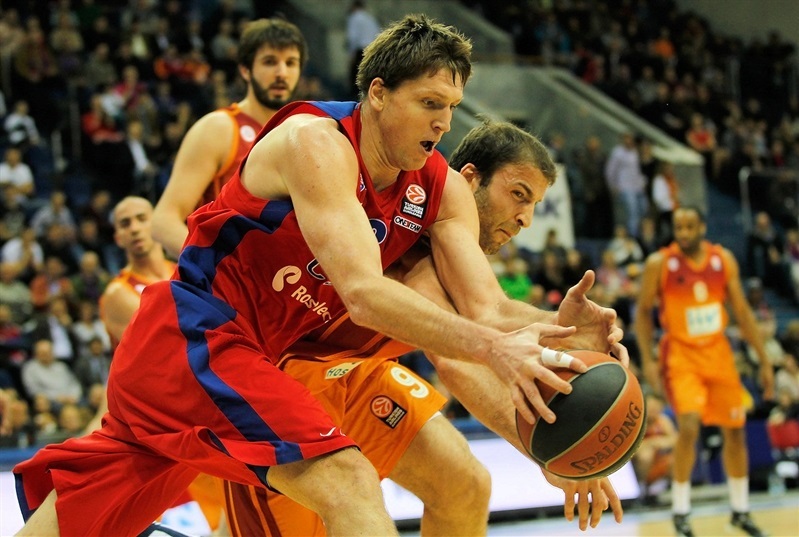 After a quiet night, Weems took charge for CSKA with a pair of baskets. Arroyo responded with a tough layup, but came up limping. Weems free throws made it 77-73 and Arroyo took a seat. Erceg reached 30 points with a pair of free throws, but a red-hot Weems added two more baskets to lead 81-75 with 90 seconds remaining. Erceg added 2 more free throws only to see Teodosic get a lucky bounce on a three. Erceg came right back with a three and a Markoishvili steal led to a Guler layup to close within 84-82 with 34 seconds to play. After Fridzon missed a three from the corner, Guler went to the line with 13.2 seconds remaining and tied the score. A free throw contest ensued; Weems made it 86-84 with 11.1 seconds left, Arslan split less than a second later and CSKA managed to run out the clock on the final play. "Surely, it was a difficult game and we knew something like this could happen. I wanted to give playing time to our starting point guard Milos Teodosic, who missed the previous couple of games because of injury, got out of rhythm and it took him a while to catch his game. It was one of the reasons for some disorder in our game. We had some good and bad moments and we know we have to work hard to play solid in the playoffs. Definitely we remember our confrontation with Real and we would like to win with a bigger margin. But I think we lost control of the situation when we lost by exactly 14 points in Madrid. When you start to make calculations, something bad happens. So we will just roll our sleeves up and continue to work." "It think strategically we played a perfect game today. We came here to control the game and not to let CSKA run. Our task was not to make too many turnovers and we had just 9, which is a good number, so we did not let the opponents get easy points off turnovers. Erceg played fantastic, a career game, but our shooters missed too many open shots today, especially Markoishvili, who made 2 of 7, and Arroyo, who made 1 of 6 threes. Still we had a chance to win the game on the last possession in the fourth quarter, but Macvan turned the ball over. For us it was important to win the game or to lose with minimal margin. We reached our goal and now we will wait for the result in Madrid. 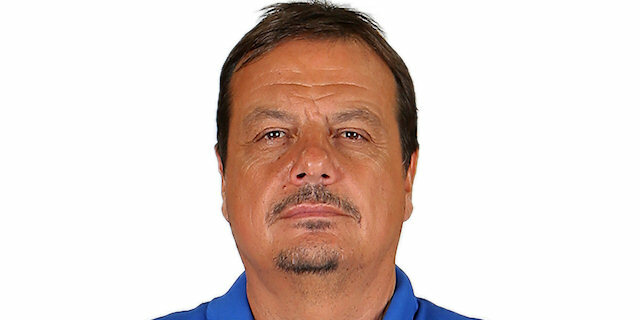 We did not foul on our last possession in overtime because Arroyo got injured, he had some pain in his leg, and we used a short rotation of veteran players. By going to second overtime we could have lost by a bigger margin because of tiredness, so we decided to stop at minus-1." "It was a tough game for us, as you could see, with overtime. I think we had a bad game, in defense especially. Erceg was really unbelievable today, 35 points, a personal record. I saw so many times in my career when a player plays great, maybe even the best game in his career against his former team. I’m happy that we won and showed our character." "It was a very tough game until the end. Both teams had a chance to win. CSKA won the game in the last seconds. Maybe if we won the game in regulation it would be a 1000% better for us. But what can I say… it was a couple of seconds and CSKA played perfect defense. About my record – it was one of the days when you score on every shot. We need to continue playing our best and beat Partizan next round to qualify for the playoffs."